The Senate urged increased funding for CAPS, sought comment on student funds divestment from fossil fuels and tabled two bills (EDER LOMELI/The Stanford Daily). In its 24th meeting on Tuesday night, the 18th Undergraduate Senate unanimously passed a resolution on mental health and wellness that encourages increased funding for Counseling and Psychological Services (CAPS) in order to hire more counselors. The Senate also approved a bill seeking comment from the student body about divesting student funds distributed by ASSU from fossil fuels. In addition, the Senate tabled a bill addressing media independence and a bill seeking to recognize the fight against Islamophobia. The latter decision culminated in the bill’s author, Senator Khaled Aounallah ’19, leaving the meeting early after a heated back-and-forth. The Senate urged increased funding for CAPS, tabled two bills and agreed to seek comment on student funds divestment from fossil fuels (EDER LOMELI/The Stanford Daily). According to CAPS Director Ronald Albucher, the average wait-time for a routine CAPS visit is three weeks. The bill states that CAPS counselors are critically underpaid; this causes problems with staff retention rates, which in turn create a lack of continuity in services for students who return to CAPS. A counselor mentioned in the bill, who wished to remain anonymous, said that demand for counselors has increased after the 2016 election, especially amongst students from marginalized groups. To combat these issues, the Senate’s resolution urges increased funding for CAPS to hire new, diverse counselors at more competitive pay rates. The bill specifies that the University ought to hire counselors that better reflect the diversity of the student body and requests that CAPS place counselors at community centers and housing front desks on campus in order to reach more students geographically. The Senate also unanimously passed a bill to seek comment from the Stanford Student Enterprises (SSE) Board of Directors and the Financial Manager of ASSU regarding divestment of all student funds from the top 200 coal, oil and gas companies. In addition, ASSU will invite comment from the broader student body regarding the implications of such divestment. 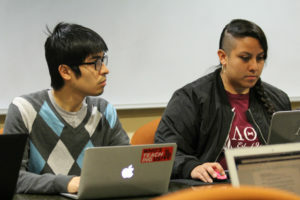 Senators ultimately decided that only verified students should be able to comment via confidential online forums and that comments will not be anonymous. The Senate went on to discuss the “Student Media Independence Act,” a resolution authored by Caleb Smith ’17, assistant general manager of KZSU Stanford and a Daily staffer. Smith’s bill sought to prevent conflicts of interest faced by student media outlets on campus that cover the Senate and also receive funding from ASSU. The bill would create an independent commission to approve funding requests from media groups. However, some senators, including Matthew Cohen ’18, were concerned that the act would simply transfer the same problem to another body without removing the perceived conflicts of interest. Senators pointed out that there have not been any instances of retaliation from a Senator based on media coverage in Senate’s history, and, as such, many senators expressed concerns that the bill seeks to solve a nonexistent problem. Finally, the Senate discussed a bill to recognize and support the fight against Islamophobia. Aounallah, the author of the bill, emphasized the importance of passing the resolution immediately in order to support the Muslim community in the context of President Donald Trump’s recent executive orders. However, Senator Jasmin Espinosa ’18 felt that the bill would have greater impact if it had more student signatures. Aounallah pointed out that the bill was crafted after numerous discussions with members of the Muslim Student Union, which he is a part of. He also said that garnering credibility was less pressing than the need to show support for the Muslim community during this time. Rosen expressed support for the effort but reiterated the need for more certified student support of the bill in order to make it as powerful as possible. After intense discussion, the bill was tabled and Aounallah left the Senate meeting before it officially ended. Contact Ellie Bowen at ebowen ‘at’ stanford.edu.